Saddam was very helpful with everything from the second I walked in from all the craziness outside in the streets of Delhi..Place is very clean and room was exactly the peace and quiet needed. Facilities are great and will for sure stay when I come back to Delhi! Great location at good prices. Decent clean rooms with WiFi and chargers. Helpful staff who can sort out bus or train tickets for you. Don't believe anyone who says you need to go to a tourist office on your way there!! Staff was so helpul when we had a problem. Thanks a lot for this! And such a warm welcome when we arrived in the middle of the night. I only can recommend this Hostel! I had a very pleasent stay here, overall hospitality was amazing, very much value for money, the staffs here are courteous and helpful., the interior ambience and atmosphere is very good when compared to the outside area, so please don’t judge this Backpackers heaven @ Kuldeep by seeing the exterior gullies and area. 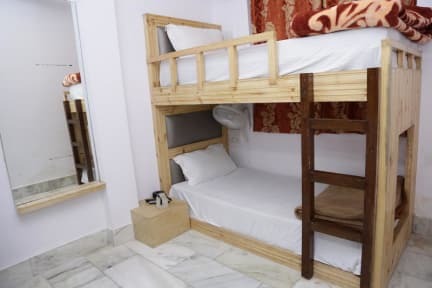 Fantastic hostel located on a busy market street right in the heart of Delhi. Staff were great and very accommodating, they also arranged a fantastic trip for us to see Jaipur and the Taj Mahal so would definitely recommend asking them about tours. The hostel can be difficult to find as situated down an alley but the friendly locals will happily guide you. Felt very safe here and thoroughly enjoyed my stay. Thank you Kuldeep Friends Hostel! Nice place, great location (a little tucked away, down an alley off the main road). The staff were friendly and helpful, but we didn't see a hangout place apart from the small lobby so maybe not ideal for meeting folks. Bathrooms could do with some TLC, there was a lot of gunk in ours and a giant millipede from the open drain in the floor. They had an adorable dog, and comfy beds, so I would stay again for a short visit. A basic but functional hostel for a layover in Delhi. The hostel is quite hard to find but they do offer airport pickup which id suggest taking over an uber! (We learnt the hard way). We had an issue with our room but the staff were helpful and resolved this for us. Not much an of area to hangout and chill as with some other hostels. Well, compared to my stays at Zostel or Madpackers, this was quite a setback. The staff was very nice and helpful, as in most of these places, however the location (or mainly the surrounding) and the cleaness of the hostel was way below what I had experienced in staying in hostels.